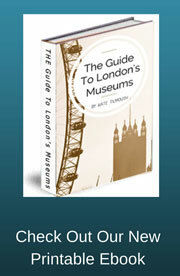 The National Army Museum is situated in the part of London known as Chelsea. It tells the story of the British and Commonwealth Armies throughout history. Focusing on the individual soldiers involved and life in general for the soldiers during various battles. The museum uses life-sized mannequins and constructed scenes to engage its audience, making it a very friendly feeling museum despite its rather sometimes horrific subject matter. A museum that despite being about war and conflict has been set up to provide an enjoyable day out for the whole family. Closed: 24-26 Dec. and 1 Jan. The museum has six floors, four of which are covered by the main exhibitions. 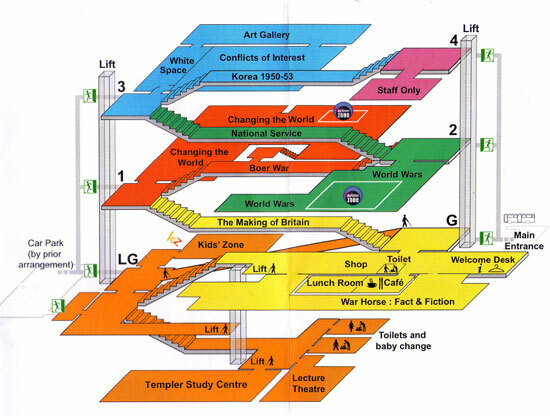 The other two floors contain a study centre, lecture theatre and Kids Zone. The Making of Britain 1642 - 1783 - Telling the story of the British army from the medieval period to early 18th century, when the modern British nation as a state was first created. 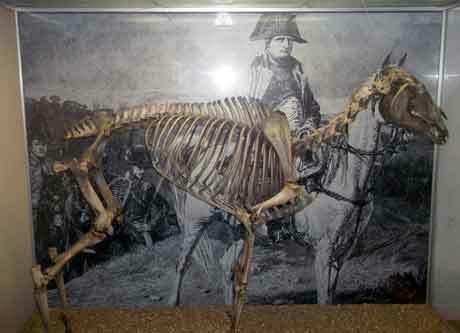 There is an impressive life-size display of a Royalist cavalryman and his wounded horse, a Parliamentarian pike man with his extremely long pike and a Parliamentarian musketeer. This Video gives you a brief overview of what you will see at the National Army Museum. Boer War 1899 - 1914 - The British army in South Africa. Changing the World 1784 - 1904 - Exploring the British Army's role in the expansion and defence of British trade, political interest, and empire. A impressive 40 square metre model of the Battle of Waterloo dominates the centre of this gallery. 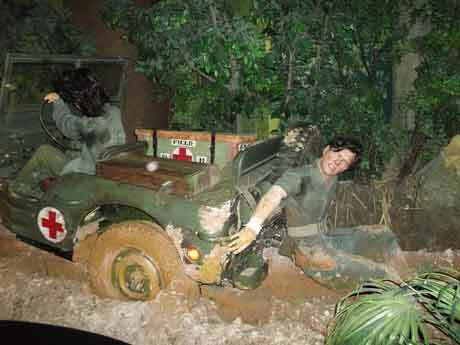 It has over 70,000 model soldiers which are brought to life with films that explore the conflict. National Service 1947 - 1963 - After the Second World War National Service was introduced where young men had to serve a period of time in the army. This display shows the life of the soldiers and some of the conflicts they took part in since the end of the Second World War. World Wars 1905 - 1947 - Explores both the conflicts abroad and the life on the home front and how the boundaries between civilian life and military life were blurred as all members of society were expected to play their part in fighting the wars. 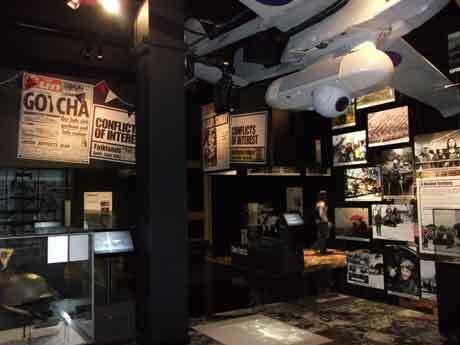 Conflicts of Interest 1969 - present - A very thought provoking exhibition which covers recent conflicts using information from newspapers and television reports and films. Korea 1950 - 1953 - a small exhibition marking the 60th anniversary of the outbreak of the first and only UN war. There is a small cafe area called the base where light meals and snacks can be eaten. If the weather is fine I would suggest that a nicer and perhaps cheaper option would be to bring your own picnic and eat it outside using the tabled and chairs provided. There is a gift shop of course which sells related items to the museums exhibitions as well a fairly large selection of military related books. The National Army Museum is situated in a rather lovely part of London right next to the Royal Hospital Chelsea which is the home of the Chelsea pensioners (retired soldiers). However the museum building itself is not very attractive and is rather brutal in design, but considering its subject matter, I don't suppose a pretty building would have worked. My first stop whenever I visit a museum is always the café as I like to relax a little and get my bearings before I begin my visit. I must admit I was rather disappointed in the cafe they had which was called The Base. It was very small and rather cramped and the food available was very basic and rather expensive. I had a jacket potato with cheese and that was it, no salad garnish at all, it looked rather sad on the plate and cost me £3.50. The National Army museum is very family friendly and a lot of parents had decided to take their children, even very young ones in prams. However as i walked round the museum I did not notice too many people and families in the galleries as I think a lot of parents take their children to the Kids zone on the lower ground floor only. I won't go into detail about all the different exhibitions as there are simply too many to mention. Needless to say the exhibitions covered various different conflicts and battles and war and military life in general. I would say that the National Army museum differed from the Imperial war museum in one major way. 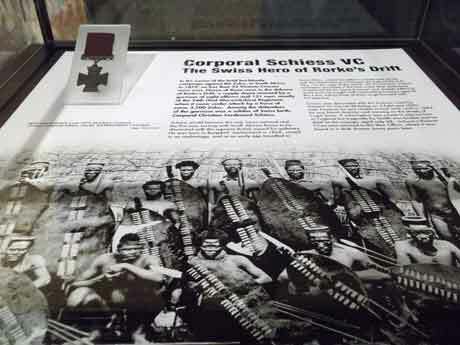 It focuses on the lives of individual solders and all through the museum you could read personal stories and see personal items belonging to soldiers throughout history. This really did bring everything much closer to home and for me made it far more interesting. There are many mannequins dressed up in various uniforms and poses in different scenes throughout the museum which again made it far more user and family friendly. It took me about 2 and half hours to walk around the whole museum but I can imagine that if you are really interested in army life that you could quite easily spend a whole day here. There is so much information, all displayed in a very easy to read and imaginative way and I was generally very impressed with the museum.